Latest News (10.12.2018) - NABARD Development Assistant Mains Result has been declared now. 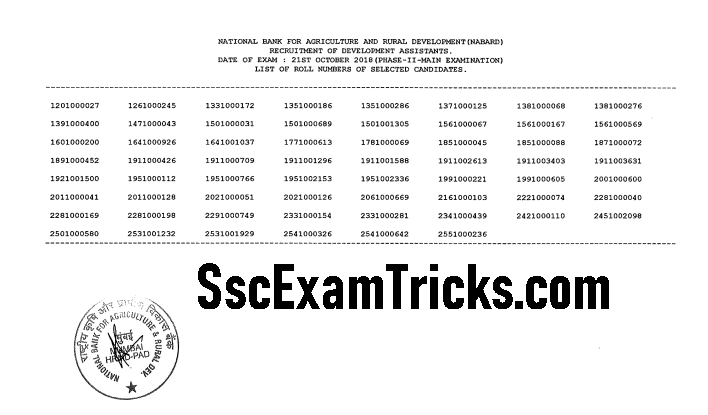 Latest News (10.10.2018) – NABARD Assistant Pre exam result has been available now. NABARD Development Assistant Result has been available for pre exam. Based on the performance of Mains exam, a final merit list will be prepared and displayed on the official website. On 28.08.2018 – The online link to apply online form has been available now. 1. Go to the official website www.nagard.org. 2. Go to the Download Segment column and click on ‘Download NABARD Result’ link given at the left bottom of homepage of website. Enter your to be registration number, DOB, Gender and verification code (displayed in the image). 3. Click on the button given as ‘Download NABARD Scorecard’. The Result / Merit List will be available on official website of NABARD. 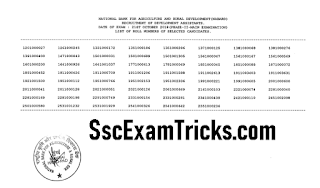 Those candidates who have applied for this post and are waiting for their online Result, Merit List, answer keys for pre & mains exam, document verification; they can download or check the related latest information from the link given in the below table.